Integrating CallTrackingMetrics with Bing Ads allows you to automatically send offline conversion events for all of your calls into your Bing account. You will also be able to view important insights related to your Bing advertising in your call log, so you can correctly track all sessions from Bing that land on your website or landing pages. 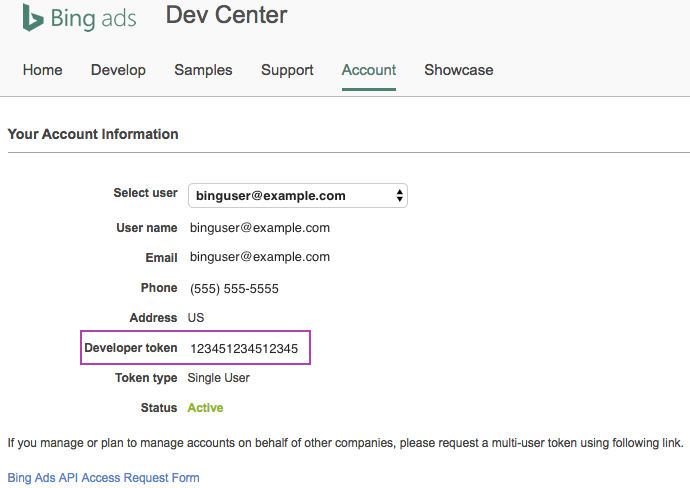 Before you begin, you will need to find your developer token within Bing. If you do not see a developer token on your profile on this page, click the Request Token button to generate a token, or ask the administrator of your Bing account to create one for you if that option is not available. 1) Navigate to Settings → Integrations → Bing. 2) Enter your developer token and click Link to Bing. 3) You will be asked for permission to allow CallTrackingMetrics to access your Bing Ads account. Click yes to allow access. The user you use to link CallTrackingMetrics must be the same user associated with the developer token in your Bing account. If your Bing integration will not sync properly, make sure you used the correct email address to link your accounts. 4) Once your account has been connected, you will be redirected to the Bing settings page in CTM. Click the Ad Account ID drop-down and select the Bing Ads account you wish to link to this CTM account. Conversion name: the name of the offline conversion action in Bing that you wish to associate with this account. Conversion currency: specify the type of currency you’re using for your conversion values. This will default to USD. Conversion default value: the default dollar amount to be associated with these offline conversions. 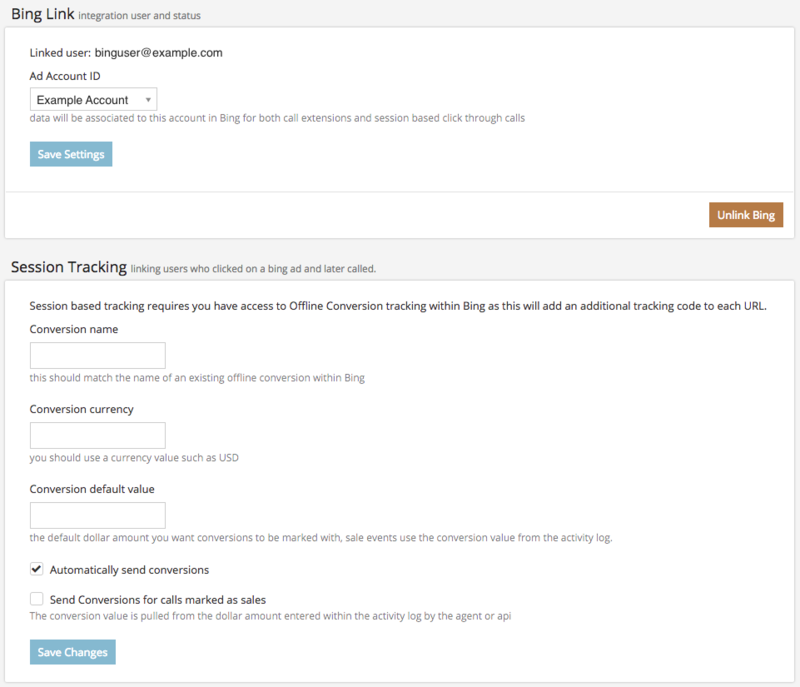 Note that sale events use the conversion value from the activity log. 7) By default, the option to automatically send conversions is enabled. Disabling this will stop the integration from automatically sending call information. 8) If you wish to send sale events for calls that are marked as conversions in your CTM call log, check the box labeled Send Conversions for calls marked as sales. CTM can also integrate with Bing’s call extensions feature. Before you begin setup, make sure you have a tracking number in your account assigned to an off-site tracking source. Any off-site source in your account will be valid for the integration. 2) In the Call Extensions section, click Enable Call Extensions. 3) Select the tracking number you wish to associate with Bing call extensions in the Associated Tracking Sources field. 4) If you prefer to wait until all campaign data from Bing is received before sending the call data to Google Analytics, check the box labeled Delay Google Analytics Events (recommended). Each hour Bing will request call data from the above Tracking Source and respond back with possible attribution data for each call to the given source. When the data can be isolated with a high degree of confidence we will associate it to a phone call. This enables reporting within the call log, the reports as well as third party integrations. Bing’s call extensions do not provide caller ID. The contact information that appears in your call log for this calls may not be the caller’s actual contact information.